Dr. Kevin Kuo received his Doctorate in Naturopathic Medicine and Master of Science in Acupuncture and East Asian Medicine from Bastyr University. His foundation for health and wellness began developing long before his formal education. His father, a Doctor of Traditional Chinese Medicine in Taiwan with more than 30 years of experience, fostered his interest in medicine since childhood. From a young age, his father instilled in him the fundamentals of health and the balance of Yin/Yang. To this day, Dr. Kuo combines his formal education with continuing mentorship from his father to help his patients achieve and maintain lifelong health. Dr. Kuo believes in educating and helping people to establish a deeper understanding and stronger connection with their own body. 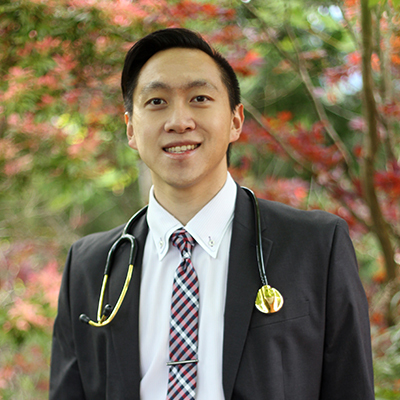 The word “Doctor” originates from the Latin term “Docere”, to teach, thus teaching is one of the core Naturopathic principles Dr. Kuo aims to provide for his patients. In our modern society, the focus on symptom based treatments and labeling patients with diagnoses causes people to limit their potential healing abilities. Dr. Kuo wishes to empower and challenge everyone to break through these barriers. The key to preventing the development or progression of any disease is by maintaining a balanced lifestyle. With the skills and tools he holds, Dr. Kuo strives to help patients with various health conditions. Dr. Kuo is a big advocate of balance, a goal he sets for his patients and his personal life. Even with a busy schedule, he makes time to eat well, have fun, and exercise to replenish the body and refuel the soul. Outside of his job, he loves to stay active. You can find him hiking challenging trails, working out at the gym, trying out various cuisines, and experiencing new events around town. Dr. Kuo is a proficient speaker in English and Mandarin Chinese. Been told ruts plant good for pain? Hi George, thank you for raising this question. I am glad you mentioned that you were told by someone… because this is why doctors exist. Information transferred between friends and family members could quickly turn into false information. Ruta plant is actually a stomach irritant and is rarely ingested. In fact, the form of Ruta that is useful for pain for certain individuals is the homeopathic version of Ruta! There are many forms of pain therapy and while homeopathy is in there, it is not my top-shelf intervention for natural pain relief! I hope I was able to answer your question, let us know if you are interested in making an appointment. Always wanted to try acupuncture , but i have a lot of worries. 1. Is it hurt ?! 2. will it be any side effects? 3. How long will it takes ? Hi Lucas, thank you for your inquiry. Fret not, acupuncture could help with your worries! 1. Acupuncture actually does not hurt at all. 2. There are almost no side effects from acupuncture. 3. An acupuncture treatment typically lasts between 20-45min depending on person to person. I hope I was able to answer your questions, you can always take advantage of our free consultation for detailed explanation. Thanks for your inquiry! There are specific acupuncture points use for smoking cessation! There are also many other modalities we use to ensure its success. If you’re interested in this, please call 425-775-6001 to book an appointment! Do you take Humana Gold and Medicare.How much money would I need to have. I have terrible neck,shoulder and back pain. I have took everything for pain meds and nothing works.My Dr. mentioned accupuncher.If I need a referral that would not be a problem.I can hardly walk now.I have had this pain for about 4 years.Thank you. Hi Leona, so sorry about the discomfort you are experiencing. It’s hard for us to verify your insurance over the internet, are you able to come in for a free consultation and talk about this in person? That way we can check to see if there is any coverage. Please call the number 425-775-6001 to schedule. This is very interesting and entertaining post. There are best Physiotherapist. It’s so helpful for all. Thanks for this type of information.